References to warfare against tribal groups are plentiful in other texts [besides the letters of Borsippa]. Parts of the anti-tribal rhetoric, accusing them of purely hostile and destructive behavior, probably resulted from the usual megative attitude toward newcomers of the residents of ancient cities. But the highly unstable nature of the period and its warlike character cannot be denied (212). The book explores the history of Mesopotamia through an examination of the rise of the cities and contribution to the formation of states and culture. The three sections are The City States, Territorial States, and Empires with between four and six chapters to each section. By the end of the book, a reader has a very comprehensive knowledge of the subject while also enjoying the work of a talented writer and historian. Highly recommended. Mark, Joshua J. "A History of the Ancient Near East ca. 3000-323 BC." Ancient History Encyclopedia. Last modified December 11, 2013. https://www.ancient.eu/review/38/. Mark, Joshua J. 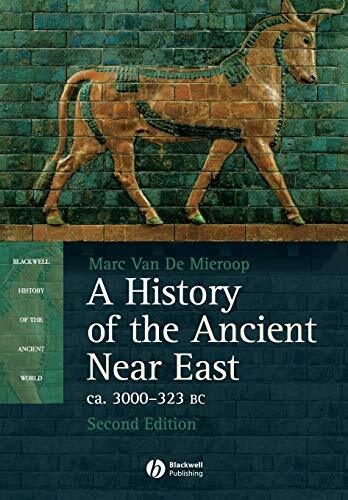 "A History of the Ancient Near East ca. 3000-323 BC." Ancient History Encyclopedia. Ancient History Encyclopedia, 11 Dec 2013. Web. 23 Apr 2019.